PoolParty lets you design knowledge graphs at your own pace and with speed. 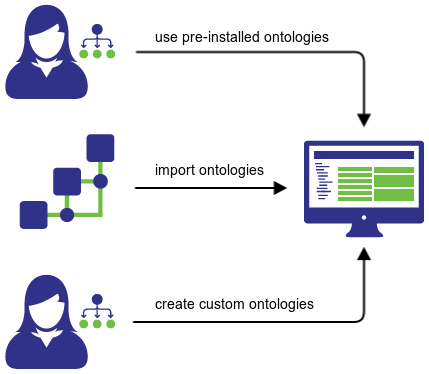 Create your own ontologies and custom schemes by reusing already existing ontologies such as FOAF, FIBO, schema.org and CHEBI, among others. Apply them to your existing taxonomies with ease. The PoolParty Thesaurus Server and its Ontology Management module are the right choice for 90% of all knowledge engineering tasks! A pre-installed ontology library includes a broad variety of knowledge models (FOAF, schema.org, FIBO, CHEBI, …), that you can easily extend to fit your own needs. You can easily upload existing ontologies and reuse them to create your own custom scheme. Create your own classes, subclasses, relation types such as symmetric, inverse, or directed relations, and more. Create attributes: integer, boolean, float, date, and more.